Moore, Oklahoma resident Jim Stubblefield raises an American flag over the rubble the day after the tornado hit. I am so proud of the product I sell, the American flag or Old Glory as she is so lovingly called. Since its inception, it has been a source of comfort for many. You see it flown proudly and defiantly at almost all natural and man-made disasters. 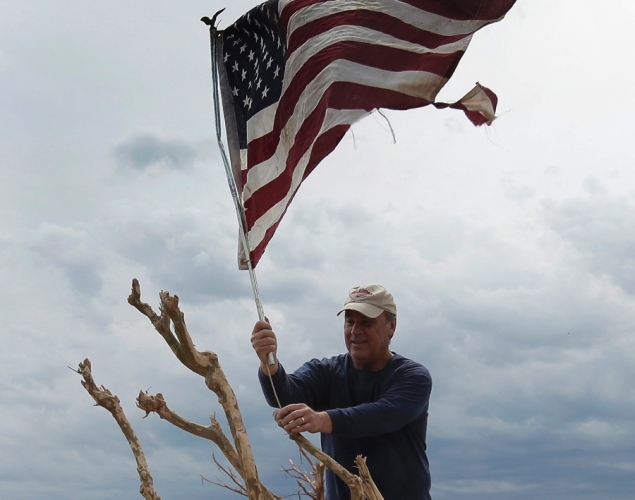 Looking at the destructive pictures of the Oklahoma tornado, and seeing the helpful men and women hoist a flag in solidarity brings tears to my eyes, even still after 39 years of selling the US flag. Listening to Jessica Buchanan, on 60 minutes, recount her rescue from Somalia by Seal Team 6 and having them gently place her in a helicopter and hand her a tri-folded American flag to hug and comfort her on the way back to the states, gave me chills. Talking to my priest, who never really knew his father, but upon hearing of his death was given his father’s casket flag, a war hero, reminds me how important Old Glory still is to us all. 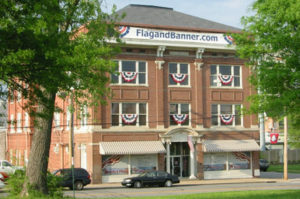 Kerry McCoy is founder and president of FlagandBanner.com and owner of historic Taborian Hall where the famous Dreamland Ballroom resides. She is also publisher of Brave Magazine. If you would like to interview Kerry or have her speak at your event contact tammie@flagandbanner.com. Equal Rights: We’ve come a long way…oh, hang on a minute!